Pressure Washer Vs. Power Washer: Which One Should You Buy? People often use the terms 'pressure washer' and 'power washer' interchangeably, though these are not the same types of machine; there is a small and subtle difference. Though they work in essentially the same manner, the difference is in the temperature of water that is supported by each device. 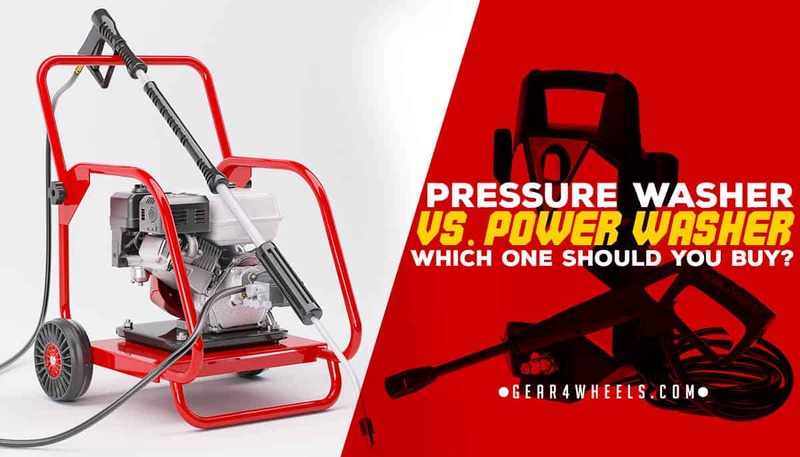 In the table below, we’ve made comparisons against the different specifications that are normally seen in pressure washers and power washers. Overall, there is not that much difference, aside from the water temperature. Averaging 2,000 to 4,000 PSI. Around 2.5 to 4 GPM is the average model for most. Requires either gasoline or AC mains electricity to power. Size and weight varies. Can be larger and heavier to account for the burner, and the smaller, electric models don’t typically offer water heating. Price can vary depending upon choice of an electric or gasoline-powered model. Gas is more expensive. Not more expensive as a rule. However, gas models are normally the base for a power washer, meaning they’re pricier. Gasoline-powered pressure washers are louder than electric models and earmuffs are useful. These types of machines are no louder than regular pressure washers. Don’t typically offer the ability to use heated water. Heat the water within a burner to enhance cleaning power. Though we can’t say that this is a completely safe product owing to noise levels and the use of gasoline, it often features safety modifications to offset risk. Not as safe as regular pressure washers, as the heated temperature could burn or damage surfaces at higher temperatures. Understanding the differences between pressure washers and power washers is key to being able to choose the machine you need. Below, we’ve broken down the guide into some of the most important selling points of these machines, as well as comparing both types, so you can decide which model bests suits you and your needs. Pressure washers and power washers can in theory be used for the same tasks, but if you’re opting to use the water heater feature, then you’ll want to carefully consider the surface you’re cleaning. Some surfaces are susceptible from damage if heated water is used in combination with pressure, so in these cases, you’ll want to use a pressure washer with cold water. Pressure washers are safe for use in most cases, though it’s more a case of being careful which nozzle you use, only selecting those that are suitable for the task. For example, the more focused nozzles shouldn’t be used on tire sidewalls when cleaning a car, as excess pressure could even cause the tire to explode. You may be surprised to know that using a power washer with a tight steam nozzle is enough to break somebody's skin. So, it only makes sense that some surfaces are too delicate for use with a power washer. These types of surfaces to avoid include asbestos roofing, and both wood and composite decking. For this category, pressure and power washers draw a tie. Both types of machine can potentially damage softer surfaces, especially if the incorrect nozzle is used. Though this is more likely to happen with a heated power washer, this type of machine is also able to handle tougher stains, so its range of uses balances out. By default, power washers are less safe than pressure washers, given that they deal with water heated to higher temperatures than normal. However, this is something recognized by manufacturers, who try to compensate by including additional safety features in most cases. With proper practice though, no pressure or power washer need be unsafe. Pressure washers often come with safety features included, which might include Total Stop Systems (TSS), which automatically shut off the pump when not in operation. However, aside from lifting incorrectly and injuring your back, these machines are generally quite safe. Like pressure washers, these machines may feature TSS features, or other similar safety functions. However, you’ll also often find additional safety features built into power washers, which normally center around the use of hot water. For example, these machines often have an automatic burner shutoff, which shuts down the machine if the water temperature exceeds safe operating limits. Again, we just have to draw a tie for this category. Sure, power washers are slightly less safe, but in almost all cases, this is addressed by the manufacturer through the inclusion of additional safety features. After pressure, flow rate and cleaning units, one of the next considerations made by consumers is often to the size and weight of the model, as this correlates directly with the ability to store the washer when it is not in use. Pressure and power washers are quite similar in this regard. Gasoline-powered pressure washers are heavy and cumbersome beasts, in most cases weighing between 300 and 500 pounds on average. In comparison, electric pressure washers can weigh in at less than 100 pounds and be carried by hand quite easily. The electric models also typically tend to be smaller, whereas most gas models are larger (though some can be purchased with a reduced chassis size). Since power washers require considerable power to heat the water, you’ll be hard pressed to find a power washer that isn’t gas-fueled. As a result, these models normally share the same bulky frame design and cumbersome weight limits seen in gas-powered pressure washers. When it comes to size, weight and the practicality of storing the machine, we must choose the pressure washer as the winner of this category. The ability to choose a compact pressure washer when storage is a concern means that you can keep storage space down. Cleaning power can be measured by looking at several factors. The true measure of efficiency – that is, the speed at which a pressure washer can complete a cleaning task – is best measured in cleaning units (CU), which are calculated by multiplying the machine’s Gallons Per Minute (GPM) with its Pounds per Square Inch (PSI). Pressure washers typically perform just as well as power washers where only cold water is concerned. They’re also far more powerful in most cases than electric-powered pressure washers. If you don’t want to or won’t use hot water for any reason, or the surface you’re cleaning is more fragile, then you’ll still be able to get the job done well with one of these machines, but perhaps less quickly. Most pressure washers and power washers shared a similar GPM and PSI rating. However, it’s in the ability to use hot water that a power washer can sometimes outshine a pressure washer. Stubborn stains, or grime such as chewing gum and oil patches can all be removed more easily using a power washer with an elevated temperature water setting. It’s clear that the winner of this category is the power washer, owing to the additional boost to cleaning power that hot water offers. These machines normally use a heating coil to supercharge the water molecules, cutting through grime more easily. Reviewing the above scores, both the pressure washer and the power washer draw a tie overall; this is likely due to the fact that they are essentially the same, with the exception of hot water capability offered by the latter machines. In the table below, we’ve put together a quick list of the biggest pros and cons associated with both pressure washers and power washers. Can help to kill unwanted weeds at their roots. Since these machines share so many similarities and benefits, it’s impossible to recommend one over the other. The question you should ask yourself is whether you could benefit from a power washer that is capable of using hot water. If you’re tackling tougher stains on a regular basis, then you may wish to opt for this type of machine; otherwise, you don’t necessarily need to select one over the other.